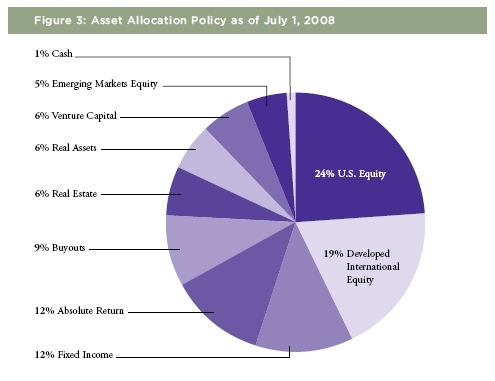 Here is the allocation of our $1.8 billion endowment as of June 30, 2008. 1) Read my discussion about the 2007 endowment for background. Most of the allocations are identical. (Is it just me, or is relabeling “Private Equity” as “Buyouts” positively juvenile?) US equity is down 3% while Developed International Equity is up 1%. Small changes like this may be due to just rounding issues. Or, instead of an actual change in policy, the movement of various asset classes, or even the timing of manager changes, can have an effect. Or, it could be that the Investment Committee made an active decision to change things. There has been some talk that the College (and/or Collette Chilton) made some genius moves that saved the Williams a bunch of money. This is doubtful, but a full debunking will have to wait for another day. The major change (which is really too small to care much about) is the move from 10% to 12% for Absolute Returns (which probably means hedge funds). According to the College’s leading financial experts, President Schapiro and Chief Investment Officer Collette Chilton, the endowment has decreased in value since Chilton last estimated it at $1.4 billion on December 31, 2008. By Schapiro’s estimate, the endowment will stand at around $1.1 billion when the fiscal year closes on July 1, with $92 million availed for the current academic year’s spending. However, “with the volatility of markets and the difficulty in pricing illiquid assets … the specific number is hard to nail down,” Schapiro said. Indeed. I think that those estimates are from the end of February. The market has rallied since then, so things are probably less bleak in the liquid portion of the endowment. It is the illiquid stuff that is the problem. For those who don’t know, much of the portfolio is invested (either directly or via managers) in things that trade every day. If the College (or its manager) owns a share of IBM, a treasury bill or an oil futures contract, then it knows exactly what that is worth. The College probably gets updates from its managers once a quarter, if not once a month. So, the Trustees will have good information about those components of the portfolio. At some point, I should do a proper calculation of where the endowment is on the basis of other benchmarks. Alas, not today. In the meantime, the main areas of worry are Venture Capital, Real Estate and Buyouts. (Let’s be grown-ups and call this Private Equity.) Most of the rest of the endowment is probably priced correctly. This illiquid portion — 21% of the total — is the real danger. 3) One of the reasons that the College is much better positioned than other schools is that we have been much less aggressive. Yale, and places like it, put much more money into these three categories (and other problematic ones). Indeed, I was positively heartened by Chilton’s talk to the Boston Alumni Society a few months ago. Not only has Williams not been forced (like other schools) to raise taxable debt (a sure sign of desperation), not only has Williams (unlike places like Harvard) not sought to sell off (at 50% losses) portions of its private equity and other illiquid investments, but Williams is actually looking to buy such investments, if we can find them in the right funds at the right prices. Almost no other major endowment (that I know of) has that sort of flexibility today. Who deserves credit? Tough to say. The asset allocation for Williams is not that different today than it was 2 years ago, so Chilton and other recent Investment Committee members deserve neither blame nor criticism. I have heard an insider praise the long-term influence of Joe Rice ’54 and Dave Coolidge ’65. Kudos to them! 4) But even if Williams is better off than most schools, we might still be in serious trouble. The key to finding out the truth is to dive into the details of the College’s investments in those three categories. Fortunately, we are not talking about that many different funds. The problem is not so much that Chilton is lying to the Trustees or that the managers are lying to Chilton or that the people behind the specific companies/deals that the managers have invested in are lying to them. The issue is that we have no clear pricing and no easy way to ensure that the estimates are flowing up correctly. No one in the entire chain has an incentive to underestimate the value of investment X. Instead, everyone has an incentive to overestimate that value, to look on the bright side, to (honestly or not) expect things to get better. Indeed, the entire industry attracts people who are naturally optimistic and whose optimism has been richly rewarded over the last 20 years. 5) What should a trustee look for? The single biggest key is the dates associated with various deals. What is their “vintage?” If most of the 9% in private equity was invested in 2002, then the College is OK. A lot of those deals will work out fine. If most of that money was put to work in 2006, then the College is in huge trouble. It is not unreasonable to think that this money could be a total loss. (Scary example here.) The same applies to real estate. If the College bought a bunch of buildings (or shares of buildings) in 1998, then all is OK. (Assuming that we kept the buildings on our books at those 1998 prices.) But, that is almost certainly not what happened. Instead, the College invested in various real estate partnerships, which then borrowed a bunch of money and bought properties. (Scary example here.) If most of the College’s real estate investments occurred in 2007, then that 6% of the endowment could be worth zero. 6) But, of course, the truth lies somewhere between. The College has had 20% or so in these sorts of investments for years, if not decades. There is a natural flow of money in and out. As one partnership completes its 10 year life, the money is returned to Williams so that the school can invest in the next partnership. So, some of the real estate and private equity investments were made in 2002 (they may be OK) and some were made in 2007 (they could be toast). The average is somewhere in the middle. Unfortunately, for the market as a whole (meaning for all large institutions considered together) this is not true. Because many more dollars were invested in 2007 then in 2002. It is impossible for everyone to be in the middle, since the market as a whole was much more heavily weighted to the later (now often worthless) investments. I have heard estimates that the dollar-weighted average in private equity is some date in 2005 to 2006. So, all the dollars invested in this category (and real estate) might be worth much less than 50 cents on the dollar. So, any trustee who wants to know the truth should ask for a listing of the College’s investments in this area (I doubt that there are as many as a dozen in each), the year that this money went in, and an estimated loss (or gain) for each investment to date. If that data looks as expected (horrible losses in recent years and much lower losses if not gains) in earlier vintages, that would be a good sign. Anything else would make me very nervous. 7) Does all this matter? Well, in one sense, it doesn’t. The College made those investments. We are no stuck with them. Maybe they will work out. Maybe they won’t. But there is nothing that the Trustees can do now to change any of that. They might consider changing the investment policy going forward, but I would not want them to be hasty on that score. The key issue is that this exercise brings to the fore just how much trouble the College is in. We have not just loss money on the endowment. We continue to spend money like crazy from the endowment. That’s the $92 million in spending for 2008-2009 that Morty is talking about above. Given that the endowment is only worth $1.1 billion (and that might be an overestimate given any mismarks in private equity and venture capital), and given that we have $260 million in debt, the net financial assets of Williams as of July 1, 2009 might be somewhere around $850 million. If you spend $92 million of that each ear for 8 years, then you are bankrupt. The Trustees need to stand up and force the College to cut spending significantly more than we already have. They should put pressure on Morty to announce and implement significant lay-offs (and early retirements) before he leaves. (Morty is in the perfect position to know where the fat is and to have the trust of the College community in making the necessary hard choices.) It would be highly irresponsible to spend “$78 to $80 million” from the endowment next year. That’s almost 10% of the College’s net financial worth! Someone needs to start acting in the best interest of, not just the Williams of today, but the Williams of 50 years from now. 1) How does the current spending level compare with our historic norms on a percentage basis? I.e., is the current spending level consistent with our long-term plan / objectives, or is it a reaction to a revenue shortage caused by the current economy? 2) Do we have any information on our replacement rate, from donations or any other source? I’m sure this has slowed some more recently, but as it is the other variable in our “spend X per year out of Y and you’ll go bankrupt in Z” equation, I’d be curious if we have any insights at all. On your recommendation, I’m not sure if President Schapiro is in a good position to make cuts. On the one hand, he’s leaving, so he could make the cuts and be the bad guy but improve the college’s financial position and allow his replacement to make a fresh, optimistic start. On the other hand, real cuts would likely involve making significant strategic choices, e.g., reductions in faculty size that affect our U.S. News rankings, football, need-blind admissions, staff cuts that affect our relationship with the town, Williams-in-Oxford, etc. If so, it could be inappropriate for him to make such decisions. Instead, perhaps it is best for him to bridge the gap in a way that has as few long-term consequences as possible while still being reasonably financially responsible. That would leave his successor in a worse financial position and thus having to make unpopular and difficult budget decisions. However, it would also allow her to implement her own vision of the college soon after her arrival. As I said, I’m unsure, but the data provided above is indeed insightful and very troubling. Questions (and compliments!) welcome. Let me start by saying that this is a complex topic about which the College is not excessively forthcoming. For example, I asked for the simple time series of annual avail spending in dollars. The College turned me down. Without that basic data, much of the below is speculation on my part. How does the current spending level compare with our historic norms on a percentage basis? The Financial Plan also provides a context and constraints for our short-term planning. Typically we limit the avail from endowment in each year to between 4.5 and 5.5 per cent of its start-of-year value. This percentage is based on the assumption that our financial assets will grow annually by at least nine per cent (eight per cent from investment returns and one per cent from gifts). If our assumptions about our asset growth and rates of inflation hold true in the long run, this avail rate will maintain the endowment’s purchasing power over time. The 4.5-5.5 per cent figure is a ceiling, not a target; the avail often falls well below that. Since the last self study, the average has been 4.26 per cent. So, we are planning to spend twice as much (on a percentage basis) next year as we have over the last decade. But note several complications. 2) I don’t fully understand the distinction (to the extent that there is one) between avail spending for operations and total spending from the endowment (including capital projects). Imagine that Herb Allen ’62 writes a $20 million dollar check for the theatre. We could account for that spending without any reference to the endowment or the avail. The College just takes that money and gives it to the builder. Avail spending is zero. Or we could account for the money by depositing that $20 million in the endowment and then, a month later, taking the money out of the endowment and giving it to the builder. Avail is $20 million in that case. Obviously, the economic substance of these two situations is identical. My understanding is that the College handles this situation by separating out avail spending for operations and spending for capital projects. They are two very different topics and ought to be handled differently. But I don’t know for sure that I have a sensible grasp on the issue. My guess is that the $80 million that is proposed for next year is avail spending for operations and that it can be directly compared to the 4.26% that is the historical standard. (And that 4.26% would only go up a bit if we subtracted out the debt.) So, the College is proposing to spend more than twice as much on a percentage basis as it has historically. That is a bad idea. I.e., is the current spending level consistent with our long-term plan / objectives, or is it a reaction to a revenue shortage caused by the current economy? The current spending level (i.e., 2008-2009) is consistent because the standard measure is based on start of year endowment. That’s before the crash for this year. The proposed spending for next year is not consistent with long-term planning/objectives. It is not a reaction to “revenue shortage,” if by that you mean fewer tuition dollars paid than expected. I don’t expect much fall-off in that. It is just that the College has grown fat, dumb and happy during the boom years. And, now, no one wants to be the bad guy and, say, cut spending even back to the levels of 2000. You see what happens to me when I even suggest such a thing. Do we have any information on our replacement rate, from donations or any other source? The College has traditionally structured its finances as follows. Annual giving from the alumni/parents drive is spent the very next year. Money comes in the door and money goes out. Everyone expects those donations to be lower this year and next, but, from the reports that I have seen as a class agent, things are not that bad. It is not a meaningful aspect to the conversation. Other major giving (the guts of the capital campaign, non-capital campaign gifts from big donors) goes into the endowment. I’m sure this has slowed some more recently, but as it is the other variable in our “spend X per year out of Y and you’ll go bankrupt in Z” equation, I’d be curious if we have any insights at all. 1) Spend annual parent/alumni giving on operations. 2) Spend tuition on operations. 3) Spend the real growth in the endowment (on average a number like 4% per year) on operations. Idea is that the College, with just these sources of revenue could go on forever, never going bankrupt, even if he major donors stopped giving. But, of course, forever is a long time and even if “operations” includes spending on maintenance and upkeep, buildings do need to be replaced. So, the major gifts match up with that spending. Although it is true that net financial wealth is only $850 million now, we can be pretty sure that some major gifts will come in over the next few years. We are so far ahead in the major buildings that we won’t need to spend that $200 million (to pick a number) on big construction. So, that money will just go in the endowment, replacing some of the current losses. Even though we only have officially $850 million, we really have (or will have $1.05 billion) so we should measure the avail rate off of that. I disagree with this thinking on several levels, but that is the case one could make for spending so much now. On the other hand, real cuts would likely involve making significant strategic choices, e.g., reductions in faculty size that affect our U.S. News rankings, football, need-blind admissions, staff cuts that affect our relationship with the town, Williams-in-Oxford, etc. If so, it could be inappropriate for him to make such decisions. I don’t want him to make those sorts of decisions (or at least most of them). Williams is not in so much trouble that it needs to change financial aid policies or end football or close Williams-in-Oxford today. But there is $10 or $20 million in cuts that wouldn’t hit those items and that could be made now. Just go back to spending what we were spending in 2002. Why is that so hard? Yes, it would mean lay-offs and that is rough, but those lay-offs are inevitable. The sooner, the better. There is no reason not to make some subset of the cuts that I recommended now. There is no reason not to do, say, 50-100 lay-offs and/or early retirements now. Once those cuts are made, and we see how the market does over the next year, we (and the new President) will be in a position to judge things like financial aid and number of faculty. But there are many cuts that many (most?) of us would agree should be made before one dollar is cut from financial aid and faculty. Make those cuts now. I see in the news feed that Williams hired a volleyball coach … so much for one of David’s (more outlandish) pet ideas. Not that NOT hiring a head coach for that program was ever a real possibility. (By the way, she sounds like a fantastic hire). Williams like all NESCAC schools will save money in travel costs next year — first by pairing women’s and men’s sports on travel weekends, and I also heard (perhaps here, can’t recall) that NESCAC is limiting travel rosters for varisty sports. I also wouldn’t be shocked if there were a few less assistant coaches, total, on campus next season, but I guess we’ll find out starting in the fall. I have seen no evidence of this. Do you have a citation? I follow the Williams endowment closely. I highly doubt that this is true. All my friends who have done worse than index funds did one of two things. I doubt this too. 99% of the non-professional investors (and a majority of the professionals as well) who try to beat the market (by doing anything other than indexing) do worse than index funds. Unless you have a very unique group of friends, all those who did other than indexing did poorly, whether it was via mistake in Japan or NASDAQ or somewhere else. One could argue that my friends who did as well as indexing were pseudo-indexing. This is a more sophisticated argument. But, betting on a series of non-US equity fashions was the chief mistake most of those who talk to me made, Japan, NADAQ emerging markets. There is always some fashion. Now it is bonds. Believe me there has been a succession of such fads and many, many folks get roped in for the current fad. Doesn’t Williams clearly have less in US equities than their importance by market capitalization in the world economy? By having the trustees approve the allocation among classes of investments, the investment advisors are ducking responsibillity for the most important decision they make. This suggests they are not confident about the allocation they push. Are you confident about the allocation? Imagine that Herb Allen ‘62 writes a $20 million dollar check for the theatre. We could account for that spending without any reference to the endowment or the avail. The College just takes that money and gives it to the builder. Avail spending is zero. Or we could account for the money by depositing that $20 million in the endowment and then, a month later, taking the money out of the endowment and giving it to the builder. Avail is $20 million in that case. What actually happened is that Herb’s check got deposited in the endowment where it remains today, minus a little recent setback. The entire cost of the theater was borrowed in a series of bond issues. The interest on the bonds shows up as debt service in the annual operating budget as does the debt that financed the science building, parking garage, student center, new academic buildings, and major dorm renovations. Most likely, Herb’s money had a temporary restriction preventing it from being spent (for example as part of the “avail rate”) until such time as the theater was built and operational. Once that provision had been fulfilled, the gift would become unrestricted. Of course, that’s just the nominal way such gifts are handled these days — recognition by all parties that permanently tying the hands of the college centuries into the future is not advantageous. Herb gets his theater. Williams gets Herb’s $20 mil. Of course, Herb could have insisted on different restrictions; I certainly don’t know. The principle on the bond issue to build Herb’s theater (i.e. the cost of construction) shows up as an addition to the net assets of the college offset by a non-cash depreciation line on the annual operating budget for the next 30 years. The reason there are two sets of books is that colleges are not traditionally used to doing their department budgeting with the non-cash depreciation and net asset increases that represent capital spending on the audited financial reports. Therefore, they back out the non-cash depreciation and asset entries and treat routine capital expenses (like a new roof or paving a parking lot) as cash expenditures in a given year’s budget. It’s pretty close to a wash, since that spending is roughly the same year in and year out. That’s why you hear talk of capital spending budget when there really is no entry for capital spending in the audited financial reports – just increases to net assets offest by non-cash depreciation. Doesn’t Williams clearly have less in US equities than their importance by market capitalization in the world economy? Hard to say. Do you mean to include only equities in your definition of market capitalization or all investable assets? 1) How do you come up with a list of all possible assets? Doing so is hard. Even if you have a list, not everything has a current price. What is the value of all the private equity investments in the world right now? No one knows. If you don’t know that, you don’t know the global value of all assets, so you don’t know what percentage of that value is US stocks. 2) Most professionals would agree that not every asset belongs in the list. Although it is true that there are some people who buy, trade and save Beanie Babies, most of is would agree that the College shouldn’t. That case may be clear, but what about fine art? So, the best that the College can do (what most colleges do) is to come up with an overall allocation to equities as a class. We can talk about whether that should be 10% or 50% or 90%, but all those are reasonable choices and no one has a good idea what the “default” option should be. So, the College picks 50%. The US equity markets are close to half the value of the overall global market, so it is reasonable for the College to put half its equities in the US. By doing so, it is not making a prediction that the US will do better or worse than the rest of the world. By having the trustees approve the allocation among classes of investments, the investment advisors are ducking responsibillity for the most important decision they make. Which “investment advisors” are you talking about? Chilton and her staff? I bet that they would make that choice if the College asked them to. Indeed, I would be shocked if Chilton, at least, did not offer her opinions to the Investment Committee. But I bet that the Trustees on the IC retain that power for themselves. Are you confident about the allocation? The College should not have hired Chilton or opened a Boston Office. The College should be more transparent in managing the endowment. The College should spend less from the endowment. But, other than these three issues, almost everything else it does is very reasonable. HWC: Glad to have you back. (And I hope that everyone can play nicely.) You often bring up facts and sources that I miss. All the allocation plans have been rendered moot by the market crash. So far this fiscal year, it has been virtually impossible for colleges to even figure out what today’s allocation is. Even if they could do that, they probably lack the liquidity to change the allocation. In fact, the cash call commitments from private partnerships are dictating the allocations now as many schools are forced to fire sale anything that isn’t nailed down (i.e. public equities) to raise cash for private partnership cash calls in private equity, hedge funds, real estate, and commodities. Current conditions and need for liquidation have created distressed sellers. The Investment Committee has made investments in several distressed opportunities; several of the endowment’s investment managers are also taking advantage of these opportunities. I think it’s likely that Williams has also been a buyer. As far as I can tell, Williams has remained in good liquidity possition. If you deduct debt from endowment value then you should also deduct debt service from expenditures. I would argue that since Williams pays it bills in $ there should be a bias in favor of $ denominated assets. There is at least a 50% chance that the $ will increase in value relative to the euro. Why else for the small premium of long term US bonds over short term ones? I would also argue against investing in art. An economic history of art I have says the way to do well in art as an investment is to buy the best stuff and hold it for 500 years. Dring this time it pays zero dividends and costs a lot in climate control and insurance. I also believe in the equity premium. And I believe it will increase following the current downturn. While I accept David’s logic on subtracting debt from the endowment, that is not the convention in widespread use. The endowment spending rate is universially calculated without regard to debt. Therefore, to be able to meaningfully compare endowment spending to other colleges, we have to stick to the same vocabulary. If we want to start subtracting debt, I would recommend starting with the $100 million Amherst just borrowed to cover operating cash. It’s one thing to take out a mortgage on a student center that will be used for 50 years. It’s another to issue bond debt to pay the heating bills, while touting a billion dollar endowment. In the spirit of why do you read EB, I appreciate reading discussions, like this, about budget/endowment numbers when there are real numbers & published percentages, as opposed to fantasy figures or speculative spending cuts. Thank you, Dave, et. al. Thank you for addressing my questions; I appreciate it greatly. If I understand everything correctly, then, your proposal is as follows: the drop in the endowment means that the amount that we had planned to spend from it the next years is no longer sustainable. We thus need to cut our spending or risk eating significantly into our principal, particularly since both expected returns these next years and the actual value of our principal may be below what we had earlier planned. The administration has proposed some cuts, but they leave the spending level still well above the long-term sustainability rate. You propose that they make additional cuts, particularly as they can be made in areas that, while unpleasant, don’t affect our core values or strategic choices. If so, that all makes sense and I agree that you are making the correct mode of analysis. To dig into the details, and actually make a proposal, though, there is one point I’d like to clear up. Specifically, reacting to what Alexander says above, do we treat our debt service as part of our operating costs? More importantly, if so, is Alexander right that we need to subtract the debt service costs from the numerator of our “% of endowment made available for operational spending” calculations to make them consistent with your proposed denominator, our net worth, the endowment minus the debt? In the first case, instead of ~5% we are spending ~7%. That is certainly unsustainable in the long-run. However, it is only ~1.5% above the long-term rate, and on a one-time basis in reaction to unexpected events it could be defended. In particular, much of our spending is not variable year to year, a new president is coming next year who should be allowed to make as many of her own decisions as possible, and spreading the cuts over two years will give the institution time to adjust and ensure that we do not act rashly. From this perspective, President Schapiro has acted prudently and reasonably in only making about 40% of the cuts that will need to be made to bring our spending in line with our historical 5.5% goal (cutting $92 mln to $79 mln, with long-term sustainability resting at around $61 mln). In the second case, we are spending at more than double our sustainable rate and have made less than 30% of the cuts we will need to reach that rate (cutting $92 mln to $79 mln, with long-term sustainability resting at around $46 mln). That seems much less defensible. It would significantly deplete the endowment, and it would leave President Schapiro’s successor to make almost all of the spending cuts and inflict them on the institution in a very jarring year. From this perspective, it would seem prudent to make further cuts in the magnitude which you have suggested, ~$10-20 mln for this coming year, leaving President Schapiro’s successor to make $10-20 mln in her first year. Interestingly, this second scenario, taking out the debt, suggests that we were already acting imprudently before the crisis, with a planned spend of 6%, $92 mln of $1,540 mln. I believe, though, that we were likely within the range of our long-term goal before the crisis. So, I suspect that my calculations must be off, or that, indeed, we need to subtract debt from the expenditures if we subtract it from the endowment. In all of this, I don’t want to put too much stock in the numbers above. As you say, we’re working with rough figures, and you’ve amply demonstrated, to me at least, that the endowment may be in bad enough shape to warrant more prudent action regardless of the debt. As well, 5.5% is at the top end of the long-term sustainability range, and given that returns and donations may not be strong the next years, it may be advisable to plan with a lower longer-term rate. For either of these reasons, irrespective of the above, one can certainly make a good case for making deeper cuts now, particularly if we these can be done without affecting our core values or long-term strategy. Still, the numbers do look different depending on how one treats the debt, as you amply demonstrate in your original post. So, I’d be curious to know if you think that subtracting the debt should also entail subtracting the debt service from the yearly expenditures, or not, or if I have somehow misunderstood things. Apologies for the long post, especially if it turns out that hwc actually already addressed this and Alexander and I simply failed to comprehend. 1) Your summary is excellent. Specifically, reacting to what Alexander says above, do we treat our debt service as part of our operating costs? The issue is largely irrelevant. Whether you treat debt service as an operating cost or a capital cost does not matter because, either way, you are paying that money each year. It just goes out the door. It does not matter what you call it. The fundamental issue is: How many dollars can the College spend from the endowment each year over the next 10 years or so? Whether those dollars are used to pay salaries or service debt or give Collette Chilton a bonus is mostly irrelevant to the issue of what a longterm, sustainable spending policy is. Now, you are correct that the debt matters. In this case, the College faces the choice of when (if ever) to pay off that debt. It could (theoretically) sell $260 million worth of stock or bonds or whatever and pay off the debt today. (There may be some technical issues associated with that claim concerning specific covenants in the debt, but this is probably mostly true.) Or, at the other extreme, it could keep rolling over that debt for a decade or more (this might not be exactly true but ignore complications for now) and then pay it off or 2020 or later. Which should the College do? Tough to say! If you think that the College’s investments (the things that it would have to sell to pay the debt) are going to do great over the next few years, then don’t pay the debt now. Pay it later. (This is the logic of the condo-flipper that has gotten the College into trouble.) If you think that the next few years to a decade might feature very low returns (perhaps even lower than the interest rate on the debt itself), then pay it off now. If you truly believe that the future is bright, then borrow more. Lever up, baby! What could go wrong? Borrowing more would be stupid, obviously. Holding pat is reasonable. Paying off a lot or most of the debt is reasonable. I would like to see the College pay off a substantial amount of the debt, but I doubt that will happen. Summary: How much debt should a college like Williams have? Tough to know. It is exactly analagous to the question of how much debt a person should hold. Say, you win $100,000 in the lottery tomorrow. You could either invest that in the stock market or pay down your mortgage. I know what I would do. 3) Your scenarios are fair statements of the problem. And HWC is correct that the convention is to use the raw endowment, not endowment minus debt. But, the convention is stupid, just like the convention of every Wall Street bank buying CDOs was stupid. Just because everyone else does something does not make it smart. And the real danger, as your scenarios illustrate, is that ignoring the debt makes the College think that it is actually richer than it is. Ignoring the debt makes people less willing to make the necessary cuts. Don’t make this more complicated than it needs to be. As a rule of thumb, colleges want to spend no more than 5% of their endowment each year. So, when Williams’ endowment was $1.8 billion, endowment spending could be as high as $90 million a year. Now, the endowment has fallen (let’s call it $1.2 billion). So the new endowment spending level has to be $60 million a year. Therefore, Williams must eventually cut it’s operating budget and/or increase revenues by $30 million a year. As a practical matter, it is impossible to implement a $30 million cut in one year. Many of the things that will get you there (attrition, early retirement, hiring freezes, pay freezes, increasing enrollment, increasing tuition, decreasing financial aid) take several years to fully kick in. Therefore, colleges are taking incremental steps: some cuts for next year, an equal or larger second serving of cuts the second year, and some really, really painful cuts the third year. $30 million is a big number. For example, you could end varsity athletics at Williams and still need to find $24 million more in cuts. Because it is a three-year process to get to the $30 million, the endowment spending rate will be higher than desired and higher than ever before in history next year. As far as debt. There is not a college in the country that subtracts debt from the endowment for the purposes of stating their endowment spending rate. Endowment is what it is. Debt service is a (usually big) line item in the operating budget. We can discuss the merits of that, but that’s the language as it is spoken today in higher ed finance. Paying off a lot or most of the debt is reasonable. Only if you ignore the current cash flow and liquidity problems. Right now, cash is king in college finances. Remember, Williams has got to come up with $120+ million from the endowment to cover operating costs over the next two years and nobody really knows if the endowment will throw off any additional cash. Amherst just borrowed $100 million because they didn’t have any cash. Their board members would have rather cut off their own right arms than borrow $100 million for operating cash. The number one job of every higher ed finance VP is to ensure adequate liquidity. In many cases, they default on bonds and interest rate swaps if they don’t. Instead, I think that what I may be missing (and, again, I don’t fully understand this) is that the $92 million of avail spending is really divided into two parts: capital spending and operating spending. And the College makes it really hard to disentangle the two. Here is my evidence (and comments from HWC on this point are welcome). Consider FY 2008, for which we know avail spending was $79 million because Bill Lenhardt told me. But then we look at the budget. Note the bottom pie chart. For FY 2008, we have a budget of $174 million and a claim that 31.8% from “Endowment Funds Needed.” That sure seems like it ought to be the avail spending. But 31.8% of $174 million is only $55 million. That was all that the College needed to spend from the endowment in 2008 (if you ignore capital spending). So, I think, the College spend $24 million from the endowment in 2008 on capital projects, presumably much/most of this on the new Academic Buildings. 1) I agree that cash is king, but the College has around $500 million in equities that it could sell anytime and another $100 million in fixed income. You can be sure that we are paying more on the $260 million that we borrowed than we are making on the $100 million that we have lent. Again, not paying off the debt is reasonable. But paying some would be reasonable too. 2) And, you are right, that everyone measures relative to the endowment. But I don’t really care what the everyone does. I don’t care if everyone has trouble comparing Williams to other people. I care that Williams measures things in such a way as to promote good decision-making. No. Williams spent zero cash on the new academic buildings. There is an identifiable sequence of bond issues that covers (in order) the science center, the theater, Pareskey, and the new academic buildings. It’s not one bond issue per building, but rather a series of bond issues, year by year, as construction on multi-year building projects progressed. Understood. However, the only way to comprehend this stuff is to see how each college fits into the bigger picture. The financial benchmarks are comparisons to similar schools in the same tier. The way we know that Middlebury’s 6.1% avail rate this year is a huge red flag is because other colleges in the same tier are spending 4.3% to 5%. It also serves as a check and balance. For example, every ultra-top tier LAC has been spending $80,000 per student per year, give or take a thou. So if I run the numbers and find that Williams is spending %60,000 or $100,000, I know that I’ve got bad numbers for Williams. Same thing if you look at per student net revenues or per student endowment spending, or whatever. You can accomplish the same fiscal conservatism you seek by simply targeting a lower avail rate. For example, Swarthmore’s target spending range has been 3.75% to 4.75% (with a long term average of 4.25%). I don’t have any conceptual problem with subtracting the debt; however, it will be very confusing to people trying to play the home version of the game if you start using a non-standard benchmark for endowment, endowment spending, per student endowment, and so forth. The number you then use for endowment (net of debt) won’t match any other statement of Williams’ endowment and casual readers will be completely lost. Even reading a Moody’s bond rating capsule will leave you scratchng your head as they reference indicators like endowment spending rate, per student endowment, and so forth — all using the standard conventions. It’s all academic. Williams won’t be able to get down to $60 million endowment spending for several years and serious bloodletting. Let’s get there first and then worry about if they need to go even lower! HWC: We agree. But do you have a guess as to what that pie chart means? I am just clueless. Nope. Not even going to hazard a guess. The student charges revenue shown on that chart doesn’t match anything on the audited financial statements, either — and that’s really not a number that is subject to much “interpretation”. I just think Williams has several different departments producing financial reports and none of them appear to know what the other is doing. I don’t think it’s any desire to be less than transparent. Rather, I think it results from the same “whatever” that produces the website. The same issues arise on reporting the basic data for the college. I dare you to tell me how many students there are at Williams College. Same problem. You can’t ever find two sets of numbers that match. All you can do is go by the most official documents — the Common Data Set and the Audited Financial Statements. If Morty says endowment spending this year is $92 million, then I take that as being more accurate than I will ever be able to figure out. I can’t even find out the endowment size from the financial report. I have to wait for the NACUBO endowment study in the fall. Thanks to both HWC and David for addressing my thoughts. For now, it seems that HWC’s back of the envelope calculation is good guiding light on what has to happen. I also find persuasive his contention that the size of the cut needed is too large to be done in any one year. So, while one could reasonably advocate for more cuts immediately, one could also defend the administration’s current posture of cutting some but leaving the longer-term work for the next president. That’s where my thoughts are for now, at least. I’ll be chewing it over and will chime in in the next thread on this topic if I get anywhere. You have to keep these major market declines in perspective. I began investing in index funds 30 years ago. My first Vanguard S and P 500 I got for $14.39. Last Friday it was about $80 a healthy increase, even in this dire time, over inflation. There have been about 4 major declines like the present one since WW II. So I don’t worry. Williams should wait to next winter before worrying about deep budget cuts. If the economy is not on the mend by January it will not be too late to do something. But, lets not panic. Brad De long of Berkelay in a recent article said that after each of the declines of 40% or more during our lifetime’s previous to the present one that the market more than made up for it in the following decade. Henry- Very true. You look at the markets following any major correction and they recover very well. I am still Dollar Cost averaging into S&P, Russell 2000 and foreign market indexes. I think anyone who is not dollar cost averaging into this market is missing a good opportunity. ..one could also defend the administration’s current posture of cutting some but leaving the longer-term work for the next president. I think most here would be surprised at the severity of the budget cutting planning being done in the inner sanctorums of Williams and similar colleges. The idea of “waiting to see if the market bounces back” went out the window several months ago. That hope was why budget decisions were postponed until the late spring board meetings. It is very clear that modelling has been underway for three years of successive budget cuts to get down to the “new reality” in endowment levels. The announcement of the budget-cutting committee (to provide cover and buy-in) was the signal that the serious cutting was being planned at Williams. The year one and year two cuts are now a certainty. The year three cuts won’t be talked about much until the trigger has to be pulled. If the third year cuts don’t have to be made, it’ll be party time in campus administration buildings across the country. The reason they can’t wait is that colleges turn a little slower than ocean liners. To complete a turn in three years requires hard right on the rudder and full reverse engines now. For example, if you are counting on 100 extra students and 20 fewer faculty, you’ve got to start the process now. Pay freezes have a cumulative effect that require starting them now to realize the full benefit in the third year. Winding down an academic program may require a couple of years to allow the current participants to graduate while closing the entry to the program for new students, etc. For example, if Williams decided to close the Developing Econ program, they would have to do so over several years. Everyone is waiting ’til next year’s freshmen sign on the dotted line before dropping the shoe with the first round of surprise cuts. Williams’ board is meeing this weekend. Swarthmore’s meets in two weeks. We’ll start to see some announcements as next year’s budgets are revealed. Harvard set the tone by announcing the size of their planned two-year budget reductions at the Faculty of Arts and Sciences division. I expect pay freezes and hiring freezes/reduction of workforce through attrition, and some low-hanging fruit like closing at least one dining hall, etc. We have these 40% market declines every 10 years or so. How could the colleges have not been preparred for a 50% one? Without drastic budget cuts? There have only been seven down years since 1970. Colleges have never encountered anything of this magnitude. It was only after WWII that colleges started shifting large percentages of endowment funds out of bonds and into equities. The spending policies at the best run colleges (inc. Williams) were designed to handle market retreats in the 25% range without short-term disruption. This market retreat, across all categories, has simply swamped even the most conservative policies. Thank you both for providing the excellent interpretations of the endowment crisis! The perspective you two have brought, both immediate and historical, has been an immense help to me in understanding the situation. EphBlog is powered by WordPress and delivered to you in 0.849 seconds using 37 queries..